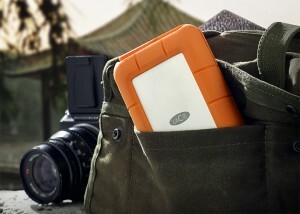 LaCie™ Rugged RAID, the latest product to join its line of iconic Rugged mobile hard drives. LaCie™ Rugged RAID features twice the speed and capacity of a standard mobile hard drive* — all with the same Rugged portability and durability that enthusiasts have come to expect. It is also the only product in its class to feature hardware RAID 0 and 1, which lets professionals optimize the product for speed or data security according to their workflow — and use it on any Mac® or PC. When on a deadline, every second counts. The LaCie Rugged features Thunderbolt™ and USB 3.0 along with two internal hard drives that are preconfigured in hardware RAID 0 for sustained performance of up to 240 MB/s**. With this speed, users can transfer 64 GB of content in less than five minutes, and even start to edit photos in the field with Adobe® Lightroom®. This time savings is key for field–based professionals who collect and move tons of data onto external storage. Professionals, especially photographers, face the challenge of keeping up with ever-increasing resolutions and file sizes. The LaCie Rugged addresses this challenge by featuring 4 TB in a compact footprint. With this capacity, the LaCie Rugged can store the equivalent of sixty 64 GB memory cards. This allows professionals to carry fewer drives while acquiring more photos, footage, and other types of content in the field. 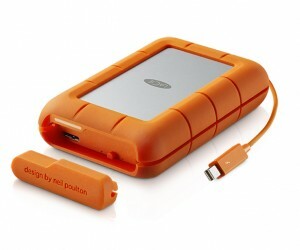 The LaCie Rugged features RAID 1 (mirrored mode), which is where the data is duplicated across the two drives. So, even if a single drive fails in the field, the data remains accessible from the other drive. This is especially helpful to on–the–go professionals with limited laptop capacity. The LaCie Rugged can serve as the primary safe storage during travel. Even in the case of a single drive failure, data is protected.